Today,Thursday 21st, the axis of the Monsoon is stuck to its Northern position along the UP plains and stretching from Punjab (Pakistan) thru Delhi and with its Eastern end over UP. As explained a few days back in Vagaries, the Easterly winds blow to the North of the axis and the westerlies to the south. Please refer to Monday axis map shown in Vagaries . Today (Thursday), in the 700 hpa chart analysis, we see another UAC formed over the Bay off the W.Bengal/Orissa coast. This UAC will track into the axis and bring heavy rainfall into Orissa and East MAP in the next 2 days, Friday and Saturday. By Saturday evening/Sunday, it will fizzle out as an embedded UAC in the trough somewhere in Central UP. Now, as a result, from Friday, 22nd, the SWM will move "from the rear" deeper into west UP and along the axis, proceed Westwards. The Monsoon progress halts as the UAC weakens (Sunday). Delhi may have to wait. After the Monsoon trough in the North weakens, the rains will rainfall in Orissa and adjoining W Bengal will decrease to a greater extent from Tuesday 26th. Resultatntly, a very windy Sunday with west winds for Kolkata. Rainfall in Kolkata will be negligible from Sunday. But, the Break Monsoon" status quo continues in the Peninsula and Western India. It will be negligible rains in West MP, Gujarat, Interior Maharashtra and the NW states till Monday, 25th. Strong Dusty Westerly winds would sweep Gujarat, Rajasthan and parts of NW India Saturday thru Monday. With the trough remaiming weak off the West coast, and the trough in the North in its Northern most position, this status quo for the region, and the west coast will continue to get meagre rainfall at least till Sunday/Monday, 24/25th. We could see the off shore trough in the west strengthening from Tuesday. 26th, to some extent. The Southern States of TN, interior Karnataka and complete AP, will see no meaningfull increase in rains till Tueday 25th (at least). Temperatures expected to rise to over 40c again from Sunday thru Monday in Coastal AP as the region gets strong West winds, blowing out in the Sea. Pakistan: Karachi will get strong west winds, sweeping thru Lower Sindh regions Saturday thru Monday. Monsoon rains have still to cover many an area before reaching Pakistan. Vagaries had put 1st week of July in the last forecast. With the Monsoon playing truant, Balochistan and Sindh will continue to heat up. As estimated, the region has heated up, with Larkana at 49c on Thursday. Another 50c is possible this weekend. Sukkur will continue to scale 46c, maybe touch 47c on the weekend. Friday 22nd/Saturday 23rd/Sunday 24th: Hazy skies, Partly Cloudy, with hot days at 33/34c and nights at 27/28c. A light rain shower with a couple of passing rains in some parts. Rain amount : 5-10 mms. Monday 25th: Partly cloudy with days at 31c and possibility of some showers in some parts in the evening. Rain amount upto 10 mms. Thundery developments on Tuesday. Tuesday forecast later. Pune: Friday/Saturday/Sunday/Monday: Partly cloudy. Light drizzle in some parts. Days will be around 32c. Thundery developments on Monday evening (may not rain). Surat: also will see no significant increase or change in rainfall till Monday. In fact nights could get stuffy at warm at 28c. Rain amount may not exceed 5 mms /day. Nagpur may see some weekend showers due to the "fringe" effect of the UAC mentioned above. As the UAC fades, the rainfall decreases substantially from Monday in Nagpur. Nice Analysis Sir. So Mumbai to remain dry or may getting less rainfall till 25 june ! Atleast weak trough of west coast giving rains ranging between 10 to 60mm at many places from South Konkan Coast to Kerala coast. But North Konkan (Mumbai, Thane ,Raigad districts ) remaining almost dry & sunny conditions most of times & weather to like May month with Muggy & sultry ! Atleast overcast condition should be there ! So I want to ask you Sir, that weather Western Disturbance dusty winds prevailing in Sindh & neighbour Gujarat state affecting in some amount for North Konkan too ? As South Konkan to Kerala are enjoying monsoonal conditions but North Konkan has different conditions even Monsoon has offical set here ! I am following your blog since 2 years, n very much impressed with your almost accurate predictions regarding unpredictable weather phenomena. I lived almost all my life in Islamabad, Pakistan. It is the most beautiful city without any doubts, I have witnessed some most beautiful years living here as I grew up. The scent of the springs of its thick forest is still fresh in my memories, the crisp cracking of the autumn leaves, summer that hardly never sizzled away by heavy thunder showers every second night. And the winters that one could roast their bodies by sitting beside the heater without feeling burnt only the smell could tell ;)... Alas!!! But it has changed dramatically over the years. We all Islooites have noticed that the weather has definitely deteriorated over the past few years. The summer heat is relentless, the rains are scanty, autumn is more like summers, winter duration has shrunk, even winter rains r very less. Rajesh can you help me figuring out why?? Over such a brief period only a decade or so weather can transform so drastically.. hopefully I will get your feed back also please let us know what this monsoon of 2012 holds for us in Pakistan. Rajesh sir your predictions are really very accurate. From the last 8 days Surat is not receiving more than 2mm per day.High temperatures and high humidity is really troubling us. As you said that on tuesday off shore trough will get strengthened so whether the monsoon will reach Surat on tuesday? Great analysis and promising predictions. I looked at IR satellite picture posted by IMD. And it appears all going happen as per your prediction. In this year, except west coast setting of monsoon appearing due to UAC from Bay in all regions. Is there any reason contribution to monsoon from Arabian banch is so negligible ? From satellite pictute it appears existance of offshore trough exists between Goa to Kerala at present. What is causing such trough missing from Konkan and Gujrat coast ? Thank you sir for your accurate predictions and detailed analysis. Rajesh, a silly question but does the the simple analogy of Hotter the summer higher the rainfall hold true? This year Mumbai had a relatively colder and longer winter followed by a not so hot and humid summer and now we see a week first phase of monsoon.. Thanks Guys for your support and encouragement..keeps me going ! Abhijit: Yes, South Konkan and Goa, specially had very good rains, but this has also slowed down now since 2 days. Strong westerly winds in NW India upto Gujarat are predicted and seen as the monsoon trough is to the North , say above MP. and the west breeze to the South of the axis is natural and common. This will not effect Mumbai. 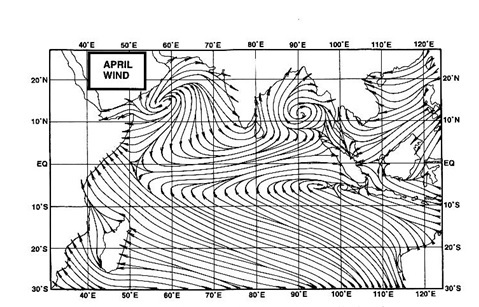 West winds will turn to SW even in NW India once the monsoon axis is seen shifting Southwards. Joshi: Thanks. But if you read my Sunday blog, I mentioned the SWM advance over Mumbai and the Konkan due to the embedded temporary UAC in the off shore trough. This has vanished and the off shore trough is weak due to poor inflow, maybe as a result of weak MJO. Ganesh: What you say can be true, but not restricted to Mumbai. A hot summer is required for a good monsoon from May onwards in NW and N India (and adjoining Pakistan). One of the factors and parameters mentioned in Vagaries' MW series. Shaz: I agree with you, that the beautiful city of Islamabad may be changing. But Shaz, this is happening in all growing cities. It ha nothing to do with what you are thinking, that is global weather change. There is nothing changing in the global weather, (see Global warming Hysteria Page on Vagaries). But yes, Urban city weather does change with more concrete structures and growing populations. See anywhere just ouside your city, say 25 kms away, it will be cooler and better. @rajesh wat is the year total for panvel,,plz update tht too!! !ths dry spell is too long !! !dnt getto enjoy the rains yet!!! @junaid Average (June-September)Rainfall for Panvel is 2888.8mm.. But sometimes yearly Average crosses more than 3000mm. If heat is required for rains to trigger, what about AP -> this summer was hottest in India and in future continues to remain so - but rains are scanty? junaid:Panvel has notched up 233 mms from 1st June till 22nd morning.